The good first: tonight I got a comment on my blog from 'Working Mum' - a new reader and a suggestion that I go to her blog Working Mum on the Verge to work out who she is. So of course I did and it is one of my best friends from school with whom I had lost touch. I don't normally read Mummy blogs, not being a Mummy, but this one is good (because she is a working Mum with a life and not a potty obsessed drone) and if you are looking for a fresh addition to your reading list you might want to check her out. Of course I started at the beginning and am up to Dec 2008 but I am assuming she maintains quality! The second, the bad. I am househunting. a house we about to view has house particulars that specify several times Karndean flooring. I have no idea what that is so I google. Then I think. Hmm, I wonder if I bought that house and I converted the garage to a studio would I want the same flooring and how much would it be. So I peruse the website. Jazzy. Lots of squares of colours and samples. But you have to see them so I think I'll find my nearest retailer. Not that I am counting all the eggs that are in one basket and have not hatched yet because they are locked in a stable which the horse has bolted ( or whatever the appropriate phrase is) but you know, advanced information is always useful. So I click on' find your nearest retailer'. But I cannot search by town only postcode. I do not know the postcode of the house I do not own. So I make some up that sound about right for the nearest big town where I know the starts of the postcodes until one works. I am invited to to fill in the compulsory fields of choosing a property on that address and my name and email before they will tell me where I can buy their stuff. Do they want to make me likley to go to a shop and buy their product or do they just want to waste my time and annoy me? On the assessment that the only logical conclusion is the latter, I figured that what is good sauce for the goose can be poured all over the heads of pesky gander. So, just in case, may I sincerely apologise for any inconvenience caused in the event that there is actually some one called Jumping Jimmy Jones at St. Pauls Cathedral school in Blackburn with the email jummyjjones13456@hotmail.com.au. And I still don't know what the stuff costs. The third: bad. I got online to quickly check emails at 7pm and five mins later it is 23.16. How did that happen? ..remember when I actually used to do that?! Househunting is tiring and time consuming and house selling means constantly tidying up my 'studio' i.e bunging items like vital threads and the last bit of matching fabric into a bag and hiding it away so that it takes up 90% of the short time you have to use them in to find them again. Sigh. I am not easily defeated though so I have found a little time to do some sewing. 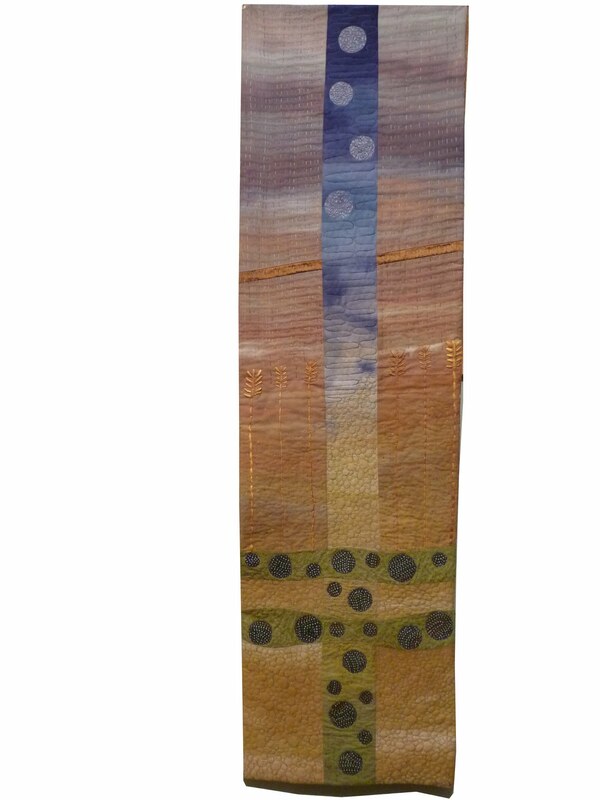 Crop Circles is about 44 x 11 inches and is both machine and hand quilted and embroidered. It does not have a wrinkly bottom so much as I polygon lassoed ( get me!) the natural drop shadow. The design was inspired simply by the two pieces of fabric used ( the two outer edges are one piece cut vertically with the second inserted) which had graduated paint ( or dye?) colours. they came in a scrap bag from Lisa Walton of Dyed and Gone to Heaven and my general playing around with aboriginal fabric in small doses with wavy lines. I lost your email when I changed laptops and didn't pay to get my email book transfered across. Sigh. This is the only way I know to contact you - can you email me with your address please? As promised, and with the permission of maker Jan Bevan, here is a photo of my favourite quilt from Trentham. It reminded me a lot of the Gees Bend quilt on the cover of this book ( which I highly recommend and was another one pressed on me by Ed at Mr B's Emporium of Reading Delights) only with much better quilting. 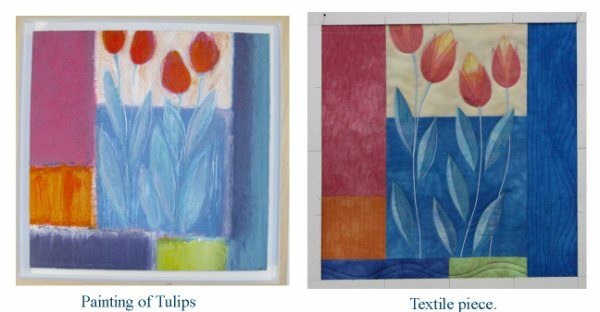 "Paintings by Rosemary Abrahams with Textile Interpretations by Janet Bevan". It runs from 27th March - 16th May, 10 - 5, at Sewerby Hall, Bridlington, YO15 1EA. Today Mum and I went to the Trentham Gardens show, relocated due to a collapsed marquee to Utoxeter Racecourse. Peversely we started by doing the gardens at Trentham themselves something which I never did while the show was actually there. We had a lovely walk with the squirrels around the Capabilty Brown lake (which contains these metal sculputures) and strolled around the Italian Gardens. After a quick lunch we set off to the racecourse, Mum to show interest in my hobby and me to hope that I still had time to see everything. Sadly, I was very dispappointed with the show this year. I thought the venue low ceilinged and cramped and the lighting was appalling. Catering by midafternoon consisted of a stainless steel pot of premade tea. However the traders preferred it to the marquee and I gather that some of the problems result from the rushed move which was not the exhibitors fault and that the venue offers possibities for workshops in the future. We shall see how it pans out. What really concerned me though was the low standard of the competition quilts compared to previous years. Many of the accomplished quilters who usually enter - such as Lesley Brankin, ( and her daughter who usualy scoops prizes in the children's section) Gwenfai Rees-Griffith, Ineke Berlyn, Stephanie Redfern and others were absent and the gap was not filled with new names of similar calibre. The way was clear for Anja Townrow to scoop a number of ribbons - and deservedly so as her work is superb. 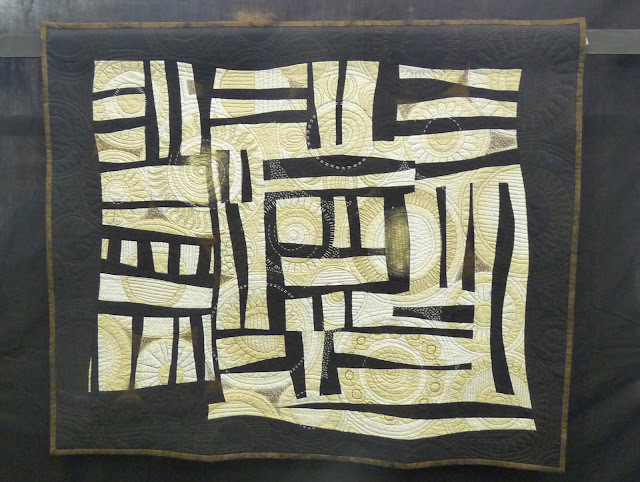 But one of her placed quilts dated fron 2005 and it was a shame that the fresh and interestingly designed work was limited to half a dozen quilts or so. One of the best was very reminiscent of a Gee's Bend but with great machine quilting, and I have emailed for permission to show it in a future post. I was surprised to find my two designs for the African Fabric Shop hanging when I hadn't entered them! It transpired that the organser had asked Magie Relph to assist in filling the space with quilts made by her, her friends and her customers and of course as she has permission to do what she will with these samples it was nice to see them there. The Kinshasa quilt on the right is now available in kit form from The African fabric Shop. in several colorways. I particularly enjoyed the Thin Blue Line qullts, some of which you can see if you scroll down this page. The Maori inspired one on the right in the first picture of that page particular caught the eye of both Mum and I. However, maybe our favourite and the one which people were talking about as we walked around bumping into acquaintances as you do was Rainforest. I have only a bad photo with no permission to post it but you can see a picture on Pauline Barnes' own website, although even her picture does not really do the quilt justice. Sadly it suffered from dreadful positioning and lighting at the show. And, surprisingly, won nothing. Interestingly, it hung near mine which also uses circles. Now I never considered mine to be a competition contender but was entered to support the show ( and yes, I can take all the crticism I gave to the general standard of the show applied to my own work, although for reasons come to below I think this one might not be too bad!). It was the first in a series I am doing using similar themes in different ways and I was anxious to get feed back from the Judge to assist me in improving towards the standard of Anja and the Thin Blue Line lot. "A lovely well balanced design and colour choice with good use of patterned and tone on tone fabrics. Beautiful stitchwork and quilting. Well executed turned edge treatment." Or at least I have no idea from her point of view. I asked Mum what she liked about Rainforest and she explained how good it was by comparing various features of it to mine, without appreciating it was mine she was using as the 'inferior' ( she prefers 'different'!) example!! She was fairly mortified when she discovered it was mine but you know, it was extremely helpful advice from someone viewing it as art. "The term tone on tone refers to a printed fabric that is made by combining different shades and tones of the same color. Tone on tone fabrics often appear to be solid when viewed from a distance, but their printed motifs become recognizable on closer inspection." I think that is probably uncontroversial. I am bemused because there are none of those in my quilt. There are some of Lisa Walton's handdyed fabrics which I assume is what she was referring to! I had another quilt in the show too - the Sacred quilt I made with Mum.The one that taught me never, ever again to piece using this particular brand of silk. Ever! I would share my results for that one too but I can't accurately do so as 5 of the 10 criteria have not been ticked in the boxes but on the line between two boxes so I don't actually know for sure what she though of it. Sigh. All I can say is that has lead to some deep thoughts on how I will be thinking about my own work in the future which will no doubt spill out into a future blog. The afternoon was not a complete loss though as I had accepted several article ideas by a magazine editor I bumped into and took the opportunity to pitch to, including the pattern for my 'good but not excellent' blue quilt above and was also able to have some useful conversations about future quilt kits using a variation of that design! Oh and Mum and I found some great 'way-too-good-to -pass-over' jackets in various designs and colour ( but none tone-on-tone!) in the sale at Trentham for £20 -30 each and brought eight of them home between us! We have a general election in the UK. There is no interesting race or gender card to make it tolerable so I have imposed a news blackout in the house at least for politics. In fact my new job prevents me from active poltical comment anyway so I am unable to express a view on which party annoys me the most. However, I do believe that I can stray into fantasy land so, here is my 'When I am Prime Minister and leader of the Don't Be Stupid Party' Manifesto for today. Lilac: I am sorry for driving around the roundabout three times at 5 mph but I am a tourist, I am lost. Cerise: Yup. That was a stupid thing I just did. I am am idiot, I accept that, I apologise for that so put your middle finger away. Yellow: Danger. I have just seen guerilla knitting and am about to slam the brakes on. Red flashing: Make way. I have a thread emergency and the LQS shuts in ten mins. You get the idea. To pay for the increased regulation this system will require ( including a consultation and public enquiry headed by a retired high court Judge into the impact on colurblind people) I will place a tax on galleries who refuse to accept textiles as a proper art medium. I fell off the blog log again didn't I? We went to Bath for a week. I may have brought some shopping home. We put the house up for sale and we have got four viewers this week. Sadly we then found out that a close friend of mine and his wife had lost their 24 years old son suddenly in tracic circumstances. So all time this week went to this comfort quilt which, after this terrible photo was quickly snapped, was delievered today. It has the initials of the four members of the the family ( including the son) in the hearts.